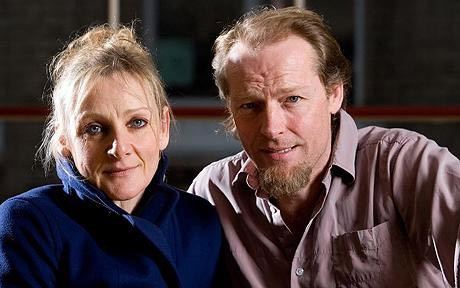 Iain Glen and Lesley Sharp talk about their roles in a new production of the perennially shocking ‘Ghosts’. Set in rainy, western Norway, this tale of a woman (Mrs Alving) who once tried to leave her philander-ing, abusive husband but was persuaded by the local pastor (Manders) to return to him – bearing him, as a consequence, a son cursed with syphilis – horrified the English press, too. The Daily Telegraph famously joined the chorus of disapproval when Ghosts (in Norwegian Gjengangere – the translates as “Revenants” or “The Ones Who Return”) premiered in London in 1891. A leader column in the paper denounced it as “an open drain; a loathsome sore unbandaged; a dirty act done publicly; a lazar-house with all its doors and windows open”. The actor Iain Glen, who is directing a new translation by the Irish playwright Frank McGuinness for a West End production in which he himself plays Pastor Manders, found a brief break during his hectic rehearsal schedule to sit down with his co-star Lesley Sharp (Mrs Alving) to discuss its enduring appeal. I began by asking about that astonishing initial reaction and why Ghosts haunts us still. It was as if Ibsen had dropped a bombshell, wasn’t it? People couldn’t understand what he was trying to say. Ghosts was regarded as disgusting, immoral, nihilistic, meaningless. Some of the things people were very shocked by, we are obviously less shocked by now, particularly his depiction of religious morality – how it can twist people – but at its heart, the play strips away a dysfunctional relationship between a mother and son and that’s still very perturbing. The great thing about the play is that it’s about the truths in a family that don’t get told. There may be very good reasons for that, but it can do enormous damage. And that’s still happening today. Mrs Alving sent her son Oswald away to protect him, but in the process she damaged him irrevocably. Having tried to be the best mother she could be, she has been partly responsible for his unhappiness and it’s unbearable. It’s a fantastic story – she’s tearing herself up with guilt every day for what she did to her son. Psychologically, it feels very accurate. Critics often praise you for roles in which you’re withholding apparently uncontainable emotion – is that why you were drawn to the part here? I’m drawn to characters that are interesting, it’s simple as that. I’ve just played Mari, the mother in The Rise and Fall of Little Voice, and she’s the antithesis of Mrs Alving – she’s a bipolar alcoholic who can’t keep her mouth shut. That was great to play! What is never good is if you’re playing a character and they are described as “a mother”. Then you’re just playing a character who is in relief to the child, so it’s the child’s story. What you want to see is the mother’s story, too. Iain Glen, you’ve had recent experience in Ibsen – playing Judge Brack in Richard Eyre’s acclaimed 2005 revival of Hedda Gabler. Do you see similarities between Brack and Manders – they’re both intensely controlling, aren’t they? In some ways, he’s a cousin part to Brack, but he’s also the complete opposite. Brack is very world-weary, with a cynical view of society, while Manders has a naivety about him, an innocence that a lot of religious-minded people can have. I think the play is more complex if we can’t readily dismiss Manders. There’s also a lot of sexual feeling that he’s repressing. He has had a great internal struggle. If you say he’s just dessicated you’ve given yourself nowhere to go. Something that’s novel about this is the fact that you’re making your directorial debut here, Iain Glen, as well as acting in the play. That sounds like a tough gig. It’s in at the deep end, isn’t it? I’ve had a few things like that in my career. The first Shakespeare play I did was Hamlet and I’d never spoken Shakespeare professionally before I did that. This was [producer] Thelma Holt’s crazy idea. We’ve had a good relationship for many years, cemented by The Crucible, which she produced in London and which was a very happy experience for me. We’d always said we’d try and do something else again and I’ve often expressed a desire to direct. Thelma feels very strongly about Frank McGuinness’s translation and has worked on two previous Ibsen versions of his – A Doll’s House and Peer Gynt – both of which were successful. To do both jobs, you have to surround yourself with people who support you. As an actor in rehearsal, you’re used to these spurts of energy where you investigate a role and then have someone sit on the side and respond to it. Not having that assessment could be a bit mind-blowing but I have a brilliant associate director [Amelia Sears] who is providing that crucial pair of eyes. How are you finding this rather unusual arrangement, Lesley Sharpe? It’s not something I have had experience of before, but Iain is absolutely there as a director. He has a vision of the piece. In essence, we’ve got two directors but the two of them are completely simpatico. It would be very confusing if they were giving different notes. The subsidised sector lays claim to so many classics. Does the case need to be made for Ghosts being revived in the West End? It’s not the easiest of sells, is it – Ibsen in the West End? We simply want to attract an audience that is drawn to a fantastic rendition of a masterpiece. We will try to serve up the best production we can, and hope people respond to it.